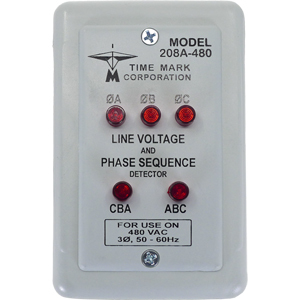 The Model 108A & 108D Line Voltage & Phase Sequence Detectors permit contractors and maintenance personnel to quickly and easily determine the proper phase sequence (either ABC or CBA), in order to install, or make wiring changes to motors, watt-meters, transformers, electrical installations, power factor meters or generators. Available in 50/60 Hz (Model 108A) and 400 Hz (Model 108D) versions, this tool can also show that all phases are present, or if one or more phases are lost, indicates which of the phases are missing. 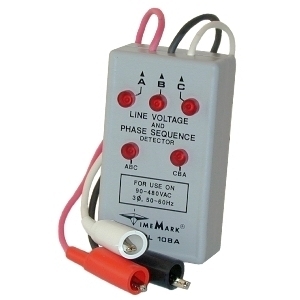 To use, connect the Detector to any 3-phase circuit from 90 to 600 volts, Wye or Delta. In proper phase sequence, and with all phases present, the ABC lamp, and the three line voltage lamps will illuminate. 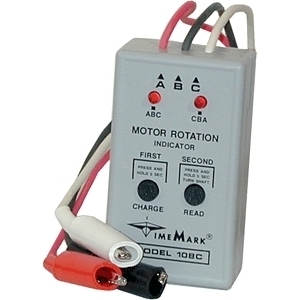 An open phase condition will illuminate both rotation lamps and only two line voltage lamps.